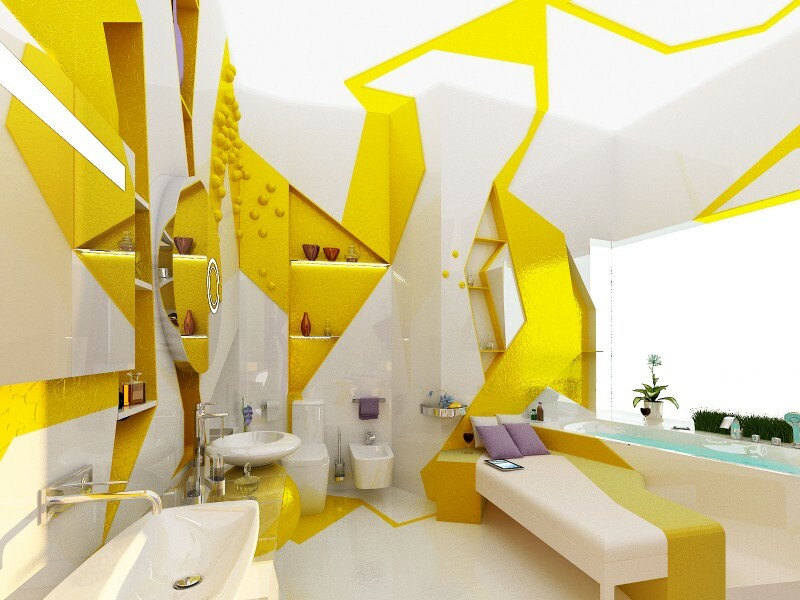 Bulgarian Twin designers Branimira Ivanova and Desislava Ivanova from Sofia-based studio Gemelli Design have sent us renderings of two innovative bathrooms concepts, "H2O in Geometry" and "An Oasis in a Sandstorm". "The Bath is very important room in the house and is probably the only one place for staying alone, relaxing, thinking and dreaming. Water is a leading element in the idea of our Bath project because it represents the natural connection between this room and the man. According to the Japanese researcher Masaru Emoto water can memorize all effects of the surroundings, including our thoughts, changing its structure. Then, with these new properties, water can affect us. That is why we entitled our project "H2O in Geometry". Water is a chemical substance with the chemical formula H2O. Its molecule contains one oxygen and two hydrogen atoms connected by covalent bonds. Water is a liquid at ambient conditions, but it often co-exists on Earth with its solid state, ice, and gaseous state (water vapor or steam). Water also exists in a liquid crystal state near hydrophilic surfaces. All known forms of life depend on water. Water is vital both as a solvent in which many of the body's solutes dissolve and as an essential part of many metabolic processes within the body. 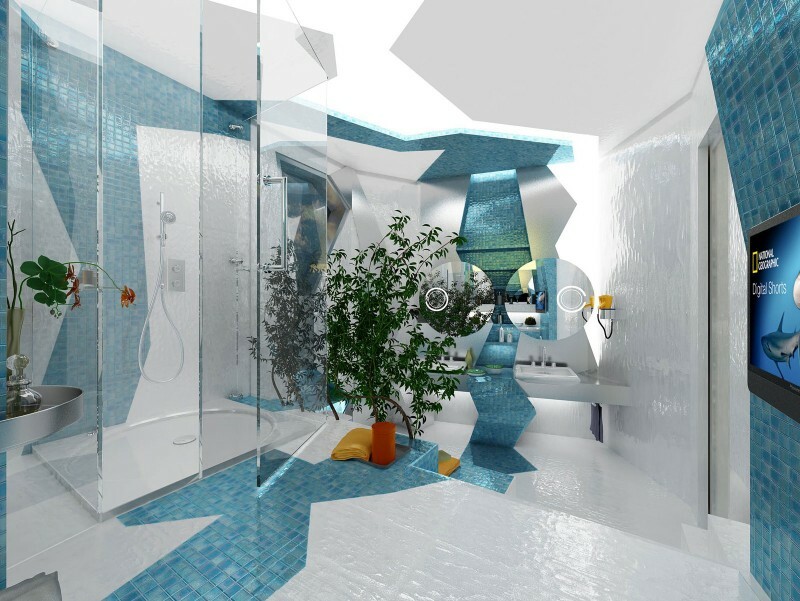 The bathroom is divided in two areas at different levels with specific functionality. 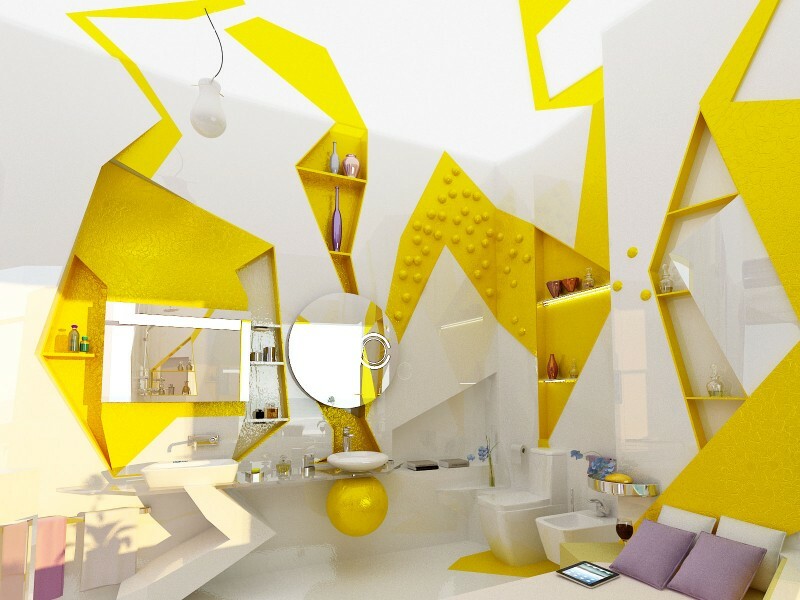 Despite of this separation we aimed to design the bathroom as an entire organism. 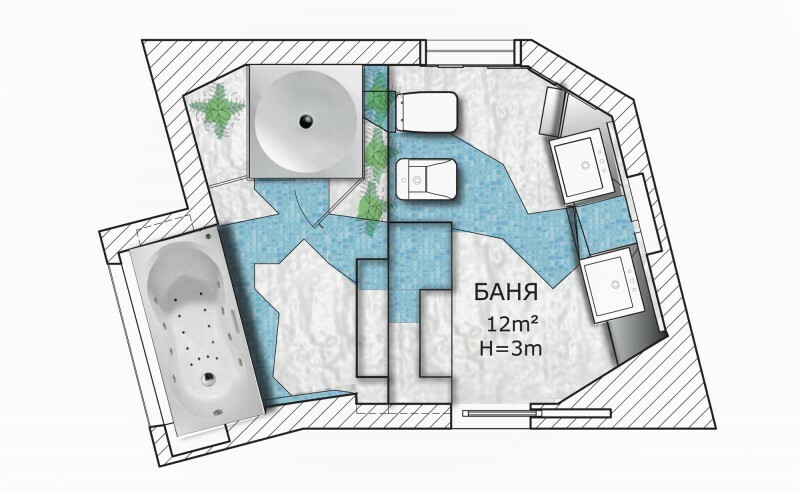 The wash-basins, the toilet and bidet are located at the lower level while the shower, at the upper level. The two levels are connected by stairs (which can also be used also for sitting). Each area is determined so as to give freedom of the body and the spirit. 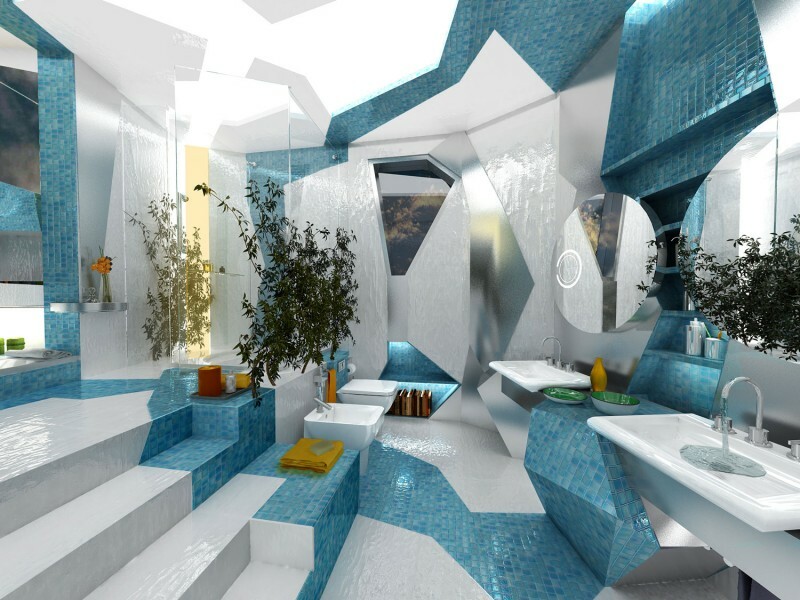 In the zone around the wash-basins, behind the mirrors there are niches in the wall which can serve without obtrusion. There is a storage cupboard between the wash-basins. 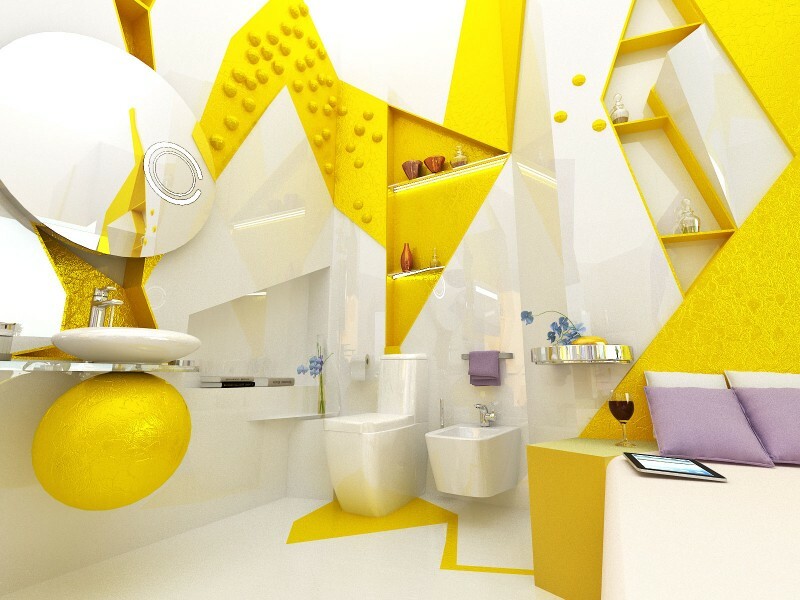 The sanitation area also has a niche which provides a place for books and a small rolling lap top." 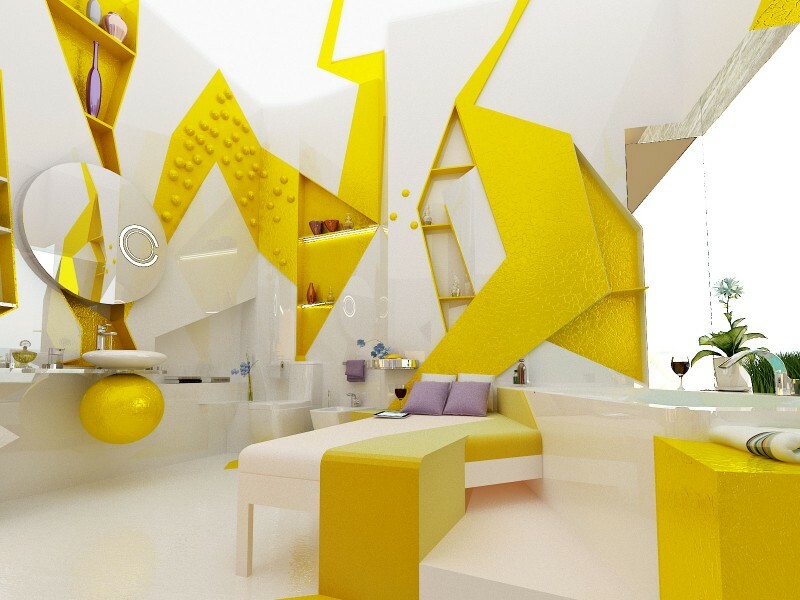 "An Oasis in a Sandstorm"
"We designed a bedroom and a bathroom separated from each other with a fireplace and a glass wall. 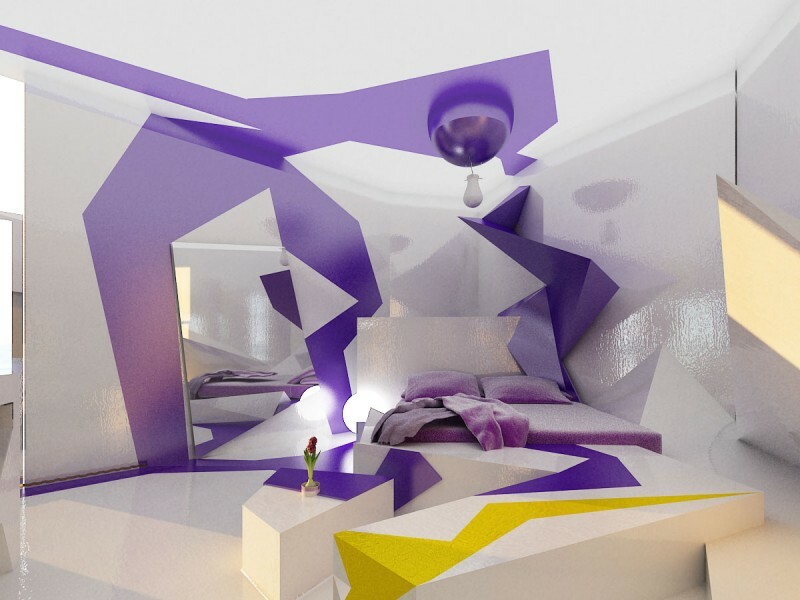 The main objective of the spaces is to provide a complete relaxation of the senses – in the bedroom the color of the imagination and spirituality – the purple; Yellow is used for the bathroom. 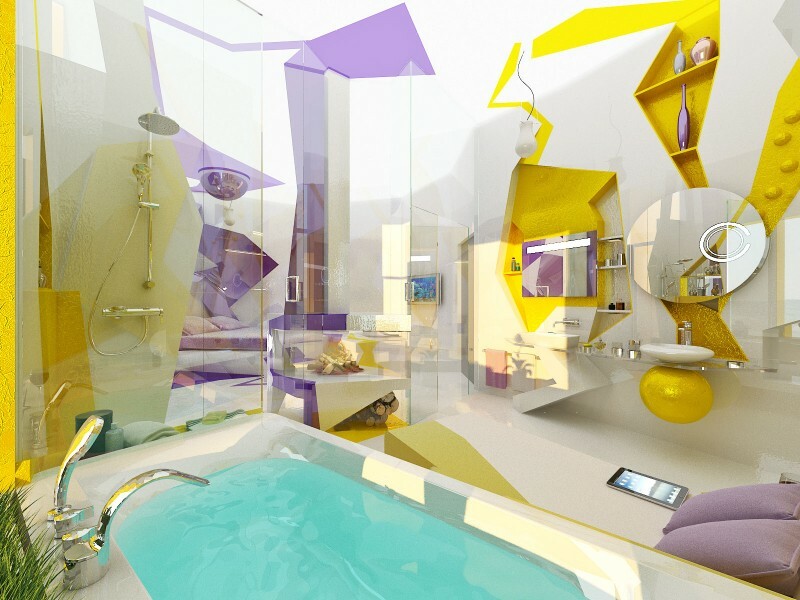 In this way the bathroom is like an oasis in the desert. We chose two different types of sinks, small round sink and wide long one, which can be used for different purposes. We decided to use console bidet and standing toilet. 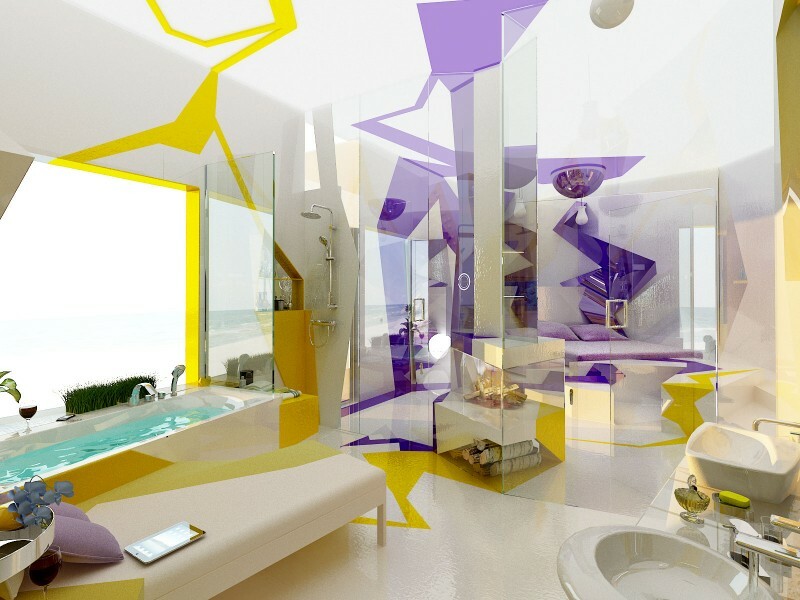 The bath is located next to the window with a nice view to the sea. The bathroom favours quiet conversations. 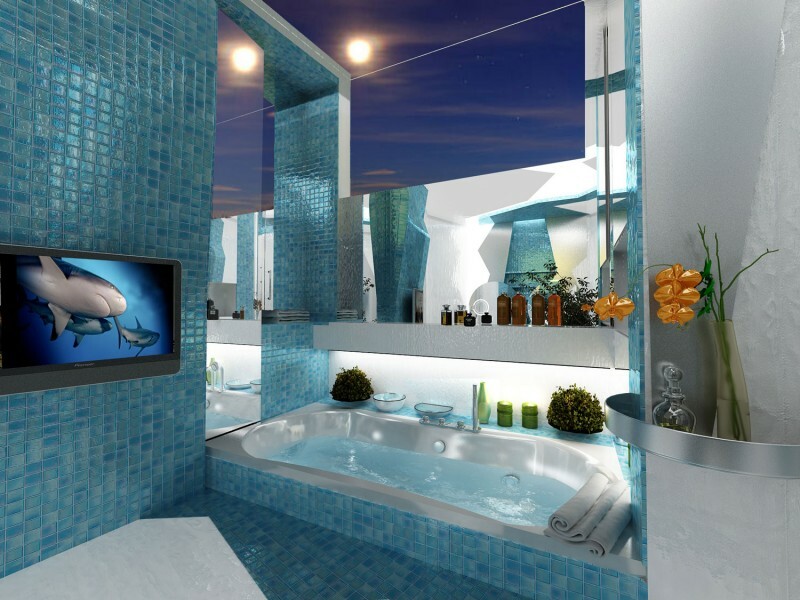 While one is taking a bath, another one is having a cup of wine on the sofa enjoying the fireplace."